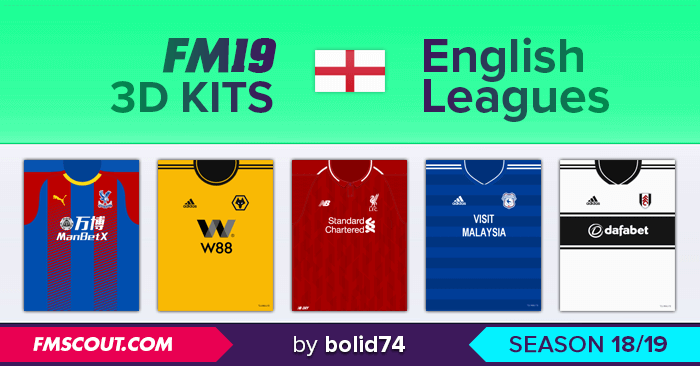 Pixel perfect English leagues 3D kits for FM 2019, and the pack includes every single Premier League team, Championship team and League One team in the 2018-2019 season. Home, away and third kits (if the team has a third kit) are all included. Note: 3D kits for the remaining playable leagues of the English football pyramid will be added to this pack in due time. This pack took a lot of hours to complete, and they are extremely detailed, down to decorative text and brand logos on collars and shorts. These kits are save game compatible, easy to install (just drag a folder) and will greatly improve your gaming experience when playing in the Premier League, Championship or League One (or against such a team). Alternative shorts and socks will still work automatically. Open FM18 and go to Preferences > Interface. Hit the Clear Cache button, and then the Reload Skin button. These kits are made by bolid74. Also published on FM View and Sortitoutsi. A project coordinated by hammer9. The kits are not showing up. I have followed all instructions. It just works with a new save? Or I can use it in a old save? You want me to make goalkeeper kits? Why? That's an amazing job, but can I ask you to create one extra add only for the goalkeeper kits for Premier league? hey urmmm ive downloaded the 3d kits and I'm abit confused on where to place them. do I place all of them in premier league folder or do I create a folder per league?? Hey man, thanks for the great work, the kits are excellent. Are you planning on making other leagues? If not do you know if someone has made any or can you share the template you use so I can try to make some for the big teams at least? That file goes to my documents...football manager 2019/editor data folder. You have to start new game and tick it on. should i copy the highlighted fmf too? This pack is now updated with National north league. These kits are only visible when you see 3D match, and also on shirts in locker room behind manager, when you start the game. How does this works? It's only for when the match is rolling or it applies on every part of the game? This pack is updated with League 2 and National league. I don't know why, but it's not working for me. Hello, any chances of releasing 3D kits for lower leagues such as Vanarama North/South? By far the best 3D kits out there. Been using his kits for some time. His 2D kits are also better than anything currently available !